If you’re a sales professional please don’t pretend you have never heard of it: It’s a sales plague that has been around for many, many years, and it’s known as “happy ears.” Whether you want to admit it or not, we have all had a pair of these at one point in our sales career. These two special words describe the sometimes unrealistic optimism that many sales professionals and leaders possess when grabbing a morning coffee, talking to team members at lunch or sitting down in weekly pipeline meetings. The unique type of optimism typically occurs after having one or two “meaningful” discovery discussions with a prospect. 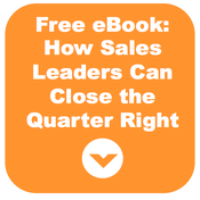 You just so happen to mention to your sales leader the size of the opportunity and how it’s not only a slam dunk, but will gain signature well before the quarter ends…mmm not so much. To have more than a mediocre sales career, it is critical to sharpen your craft daily and find creative ways to prevent having happy ears at any point throughout your sales process. Regardless of whether you’re selling for a Fortune 500 company or an innovative startup in the heart of Detroit (wink! ), happy ears can be detrimental to hitting your annual targets and also to your quarterly forecasts and company growth. 1. Is the company in any position to afford a new solution? 2. Is the company going through an acquisition or management change that could impact the decision of this project? 3. Does the company or industry fit with your solution? 4. Is there a specific timeframe and/or compelling event that could fit with the launch of your solution at that company? 5. How does this project rank in their queue of priorities compared to the others their team is working on? 6. What obstacles could get in the way of moving this forward? 7. Are you speaking directly to the contact with buying power? If not, is your primary contact willing to provide this introduction? 8. Does this initiative have support at an executive level? However exciting a company or opportunity is to be a part of, remind yourself to slow down and ensure you’re uncovering all potential hurdles that could prevent prospects from moving forward with your solution. Voice your concerns. Ask uncomfortable questions. Discuss potential objections. This will all be instrumental in never being viewed in the office where you’re walking around as “that guy (or girl)” with a giant set of happy ears. Prevent happy ears in sales with these best practices.